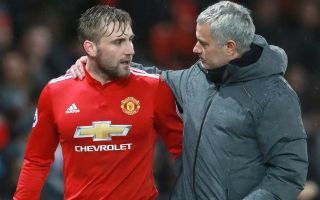 Luke Shaw has opened up on what has been a difficult period at Man Utd and his relationship with boss Jose Mourinho during that time. The 23-year-old has undoubtedly had his ups and downs at Old Trafford since joining the Red Devils in 2014 from Southampton. In his four full seasons with the club, he has failed to make more than 20 appearances in a single campaign, with injury woes, fitness troubles and issues with his form keeping him out of the side on a regular basis. As noted by The Telegraph, Mourinho has never been shy in publicly criticising the left-back, but there is undoubtedly an upturn in his story in Manchester this season. Having established himself as a regular thus far with four appearances in the Premier League, Shaw has also won back his place in the England squad under Gareth Southgate. With things on the up, the defender has spoken about his relationship with Mourinho and believes that he is now finally heading out the other end of a tough time for him personally at Man Utd. “I think he got frustrated with me because he knew I could do better,” Shaw told Sky Sports. “When I look back, maybe he was right. It was a tough few years but it made me stronger mentally. I wanted to prove to him I can do what he said I couldn’t. Shaw certainly seems to be doing that so far, but consistency and steering clear of injuries will now be priorities for him to build on the start he has made and avoid another setback. Having proven his worth to club and country again, perhaps the hard line adopted by Mourinho has in fact worked in the long run for his player.